In their natural habitats, canaries and other birds learn their species’ songs by listening to the singing of their parents and neighboring birds. The process starts when they are still in the nest, and, with most birds, ends once the adult song is mastered. Canaries, mockingbirds, starlings and some others are particularly gifted mimics, and may modify their species-specific song with tunes “borrowed” from other birds. Some canary breeders house their young birds in locations where they will be sure to hear the melodies of linnets, robins, warblers and other noted songsters. Canaries raised in this manner often produce very beautiful and unique songs as they mature. If your busy schedule does not allow you the luxury of taking your canary out for “music education” strolls in the forest, you might find the Feathered Phonics Teach Your Canary to Sing Bird CD helpful. Your canary might adopt an entire track as his own, or “pick and choose” bits and pieces of the varied selections to add to his repertoire. Researchers at MIT have recently gained important insights into the methods by which young birds acquire the adult song. Much like human infants, fledgling birds babble incessantly, all the while practicing and fine-tuning until eventually the song comes together. It was discovered that birds have two separate song-related brain pathways – one for the immature (“babbling”) song and one for the adult song. Previously, it as thought that there was only one pathway, which matured over time. This finding may be of use in understanding how people acquire speech and knowledge. In birds, the “immature” pathway largely ceases to function once the adult song is learned…in most species the song’s makeup remains unchanged thereafter. Humans, however, continue to refine, discard and add to just about every facet of what we learn over time. 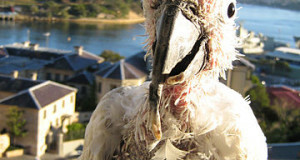 It is hoped that further studies of avian brain pathways may lead to insights into our own. You may be surprised to learn about the quite dramatic story behind the canary’s entry into the pet trade. Please check out my article Shipwrecks, Vicious Dogs and Escaped Birds….the Odd History of the Canary (Serinus canaria). Hi I was glad to see this article, my canaries definitely sang better when I had 2 males in 1 rooom and 1 in another that was in their hearing range. Now I only have 1 and wonder if his singing will change? I have heard much about the shama thrush that you mentioned, are they legal to keep in the US’? thany yu. Hello Sue, Frank Indiviglio here. Do you have a female with him? Sometimes the male sings less when he has no competition, but also when he is already “sure” that he has a mate – some bird owners feel the bird is expressing the feeling “why bother, now that I have impressed her”! Separating the pair for a time, if not stressful to them, usually causes a “change in attitude” and more frequent song. However, a simpler method is to use the Canary Song CD’s in place of a rival male. They are designed to help improve the bird’s song, but function very well as “competition” – playing the CD may cause your male to sing with renewed vigor. I look forward to any questions you might have. 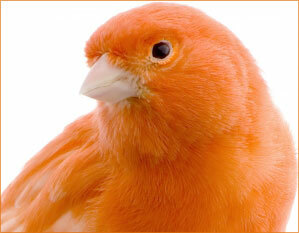 You may also find our Canary Handbook useful. I’m not sure I have the facts right, but if the bird’s leg dropped off (which can happen without seriously affecting its life span) than it is possible that the bird will not sing. 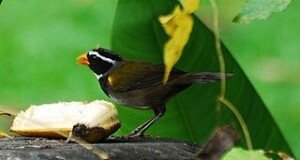 Singing poses a risk to wild birds, as it attracts both mates and predators. A singing male is announcing his good health and ability to produce strong young. One with a handicap will often cease singing; illness, or threatening situation will also cause this. Reproduction is the first function to shut down when all is not well (which is why many animals survive but do not reproduce in captivity). Canaries have been captive bred for many generations, so they sometimes “bend the rules” a bit – the bird may feel secure enough to sing again as time passes. Good luck and please keep me posted., I would be very interested to learn how this turns out. Hello Nabil, Frank Indiviglio here. The quality of a canary’s song depends upon genetics and experience; the genetic portion is fixed, but the experience part is flexible. Birds removed too early from their parents, or those that have not been exposed to the singing of other males, often develop poor songs. The CDs listed in this article can help; another option, if available to you, is to let your bird hear another male singing – if you have a friend with a good singer, perhaps you can bring it there? Local bird clubs may be able to help with this – perhaps check the internet for a canary club nearby. I love canaries and want to know how to trai my canaries to sing by downloading beautiful canary songs. how possible can this be? The CD’s mentioned in the article are the easiest method I know of. There are plenty of recordings of singing on canaries on YOuTube as well, but they are rather short…may not be useful unless you can string together somehow. Exposing canaries to the songs of local wold birds through an open window, etc. is also useful, as some canaries will add additional tones or notes to their songs. One is my female who’s been living with me for almost 2 years, and she has attempted to build nest and laid sterile eggs several times, though right now she calmed a bit. The other one is a young male, supposedly he’s about 6 – 7 months old now, but did not sing much, even though i let him heard canary song CD… Though I’m beginning to think the CD isn’t “mimicable”, because he did respond to canary songs I’ve downloaded from internet. Perhaps there’s another way to make him more “sing-ier”? I know what you mean…frustrating to wait! Interesting that he’s responding to one and not the other type pf recording. I know that canaries will respond to the CD’s; perhaps an individual difference in bird or timing is involved. Try the CD after he picks up more tunes. Separating the 2 is the best way to encourage him to sing; they will also be more likely to breed when re-introduced and he’s aged a bit. Hearing wild birds, if possible, can also help. Hello, Thanks for helping canary lover. Will you tell me the exact time of canary learning songs. I heard that the baby when they are too young they learn but not sure. Please explain it the exact time to me I have usually each two months birth of canary. There is evidence that nestlings benefit from hearing the songs of adults even while they are far too young to sing themselves. The actual timeline is not known, but it would be beneficial to let them hear adults while they are still in the nest.